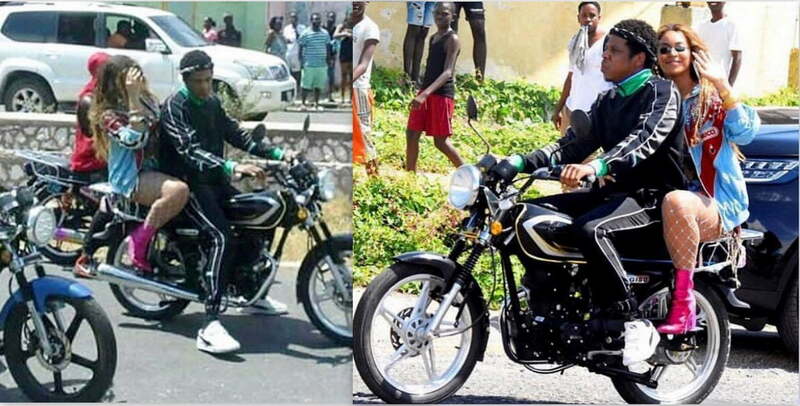 The motorcycle that JAY-Z and Beyonce rode in Jamaica could fetch north of JM$5 million. 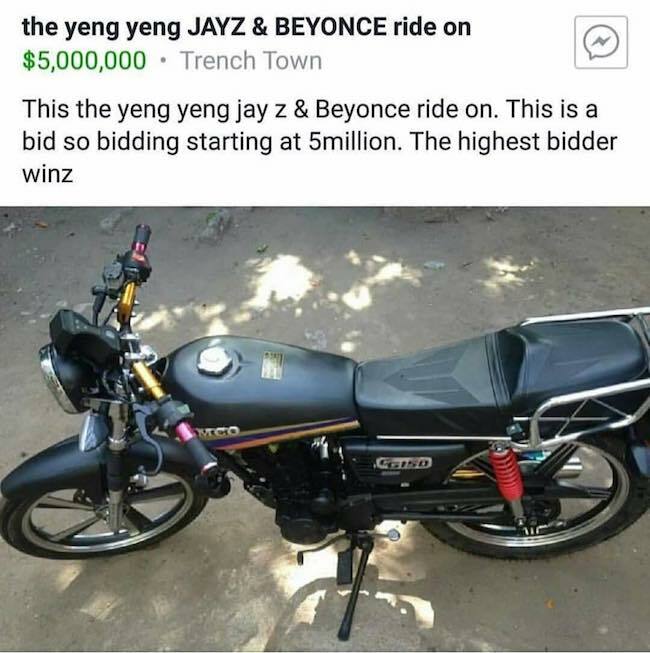 The bike, aka Yeng Yeng, is currently up for auction by it’s owner and the starting bid is $5 million. Last week, JAY-Z and Beyonce were in Jamaica shooting a music video and vacationing. The power couple brought along their twin, Sir and Rumi, for the trip to Jamrock. There is still a lot of secrecy surrounding the music video shoot, but we’re told that it’s for a single on their upcoming joint album. Hov and Bey were spotting riding through the streets of Trench Town in St. Andrew while being followed by their film crew and entourage. Bob Marley’s hometown was like a full-fledged Hollywood movie set. It drew a large crowd of locals who couldn’t get enough of hip-hop’s most famous couple. There were enough police officers and private security on hand to contain the crowd and protect JAY-Z and Beyonce, but their Jamaican fans showed all love. The value of the motorcycle they were spotted on instantly went up 50 times its original value. Bidding starts at JM$5 million which is approximately US$40,000. So far no one has stepped forward to make a bid, at least locally, but perhaps some collector will come forward and foot the bill and make this piece of metallic relic their own. The couple also traveled in a Range Rover when they weren’t filming, so perhaps the Range will go up for auction as well. JAY-Z and Beyonce are getting ready to hit the road for their joint “On The Run II” tour starting on June 06 in Cardiff, UK. The European leg of the tour climaxes on July 17th in Nice, France. The North American leg starts on July 25th at the FirstEnergy Stadium in Cleveland, Ohio. Check out the full list of tour dates here. #beyonce and #jayz on the run in ??????? ?